Shoal Bay would have to be one of Australia’s best beaches. There is a holiday park and you can hire catamarans, paddleboats, surf skis, sailboards, canoes and waterscooters on the beach (in season). Waterskiing and paragliding can be pursued and there is a game-fishing club which hosts one of the biggest gamefishing competitions in the southern hemisphere each February. The fishing from the headlands and beaches is generally rewarding. At the easternmost edge of Shoal Bay is Tomaree Head (168 m). There is a car park and picnic area at the base of Tomaree Head. Opposite the car park is the start of a walking track to the summit where the views are breathtaking. There are several offshore islands: Boondelbah, 3 km to the north-east covers 9 ha. It is a nesting and breeding site for little penguins, white-faced storm petrels and a variety of shearwaters. Just to its north is Cabbage Tree Island (26 ha) named after the cabbage tree palms in the two gullies on the island’s western side which are the only known nesting site of Goulds petrel. It is also, reputedly, the only island with a rainforest ecosystem in Southern Australia and was the first gazetted flora and fauna reserve in NSW. 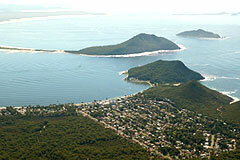 Fort Tomaree was established on the head during World War II. Two large gun emplacements (sans guns) lie along the main track. If you wish to see the other relics walk beyond the initial path, past the hospital, to a secondary track. The visitors’ centre in Nelson Bay has a booklet called “The Guns of Tomaree” if you wish to know more. Tomaree Head lies at the northeastern tip of Tomaree National Park which covers 896 ha of the southern peninsula from the headland at the northeastern tip following a strip south and then west around the coast to Boat Harbour and Little Kingsley Beach. The beaches are attractive and ideal for swimming and fishing. The park is full of birdlife and, from July to February, wildflowers. In all, the bushland around Port Stephens supports considerable biological diversity: 230 bird species, 48 mammal species and 650 plant species. Shoal Bay was supposedly named by Governor Macquarie because of its sand shoals.